Thermal mass is a well known term but is not that widely understood, unlike insulation. It is an under rated ingredient of comfortable healthy indoor environments. But thermal mass can either be your best friend or worst enemy, it all depends on how it is used in the building envelope. Light weight (no thermal mass) and heavy weight (lots of thermal mass) dwellings do not behave the same and are usually operated differently by the occupants. Heavy weight dwellings are much less sensitive to problems caused by over glazing. Thermal mass delays and reduces the transfer of heat. 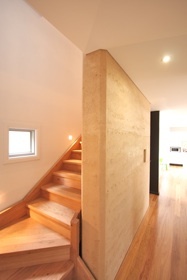 So concrete has a high VHC rating but when you compare a 90mm concrete wall with a 300mm rammed earth wall, rammed earth provides almost 3 times the thermal mass. The easiest way to explain thermal mass is to use water as an example. If you add energy to heat or cool a body of water and place it in thermos Flask, the energy of the waters’ thermal mass will last for many days. Take the lid off the the thermos, and the energy will be lost in an hour. So if you put that theory into house design, any internal thermal mass that is insulated from the outside will help smooth the peaks and troughs through a process called thermal lag. Any energy introduced into a high thermal mass building will be stored longer, acting like a hot water bottle. The key to appropriate thermal mass is using solar passive principles for your climate. In temperate or sub tropical climates, allowing the sun to warm the walls in summer and shade them in winter help the performance of the dwelling. So high mass external northern walls in the southern hemisphere and external southern wall in the northern hemisphere will generally work well. Conversely, high mass walls that never receive the sun in winter will constantly leak heat as they have little insulation value and the heat escapes too easily, similar to having too much single glazing on a wall that never sees the sun. This all changes for climates with high diurnal changes in temperature. Desert like environments that are hot in the day and cold at night can have high thermal mass every where as the temperature is constantly going over and under the comfortable internal temperature, so the thermal mass will even this out. Tropical climates can benefit with appropriate thermal mass but care needs to be applied. Earth as thermal mass will also help regulate the humidity of a building, making it even more comfortable for the occupants. This has been used for thousands of years but is over looked in modern buildings. The science of this is called Hygrothermal behaviour and it pertains to the movement of heat and moisture through buildings. Approximately six times as much heat passes through a mud brick or rammed earth wall compared to an insulated brick veneer wall. This works well if you are using earth walls facing to the sun (but shaded from the sun in summer), as it allows for natural air changes, without loosing the thermal benefits. This effect has been termed “natural air conditioning”. When evaluating thermal mass, you also need to consider the amount of embodied energy in the materials, the longevity of that product and the disposal of the thermal mass at the end of the life cycle. More on this in future posts. Please subscribe.